Fact: Speeding is not only unlawful but irresponsible and threatens other motorists and road users who want to travel safely. Government advice is that drivers need to take regular breaks to avoid tiredness, and drink-driving is illegal and dangerous. Many drivers don�t realise that speed is responsible for more deaths than drink-driving. In the year 2002, 59 per cent of drivers exceeded the 30mph speed limit in urban areas, down from 65 per cent in 2001. In 2002, 3431 people lost their lives on our roads: a third of these fatal crashes were due to excessive speed and 179 of the dead were children. The Association of Chief Police Officers says that speed is the most important factor in road crashes, more so than even drink or drug driving. During school going in and coming out times (approx 08:30 to 08:50 and 15:30 to 15:50), Pound Lane is designated a voluntary one-way street to avoid congestion and danger to the children. During these times, traffic is encouraged to flow only from Church Street towards Cooks Mead in a westerly / north-westerly direction. Instead of parking directly outside school, parents can avoid congestion and park in the Village Hall car park, they can walk across the road and up the steps to pick up their child. If you really must park outside school, please do not park in the the bus bay where the taxis and minibuses pick up. There is a forum in the Uplyme Debate discussing issues related to Road safety in the village. Click here to read the views of the members and please do join in if you have something to say on the subject. Many people are beginning to come around to the view that it is not environmentally acceptable to use large four-wheel drive vehicles for short trips in the urban environment. 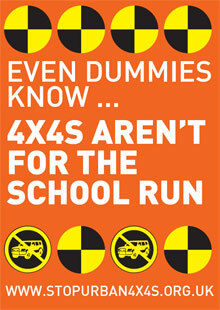 A pressure group called the Alliance Against Urban 4x4s puts the case very strongly on their website. Even self-proclaimed petrolhead Jeremy Clarkson, co-presenter of BBC's Top Gear said "I do have to say that the drivers of these things in cities must be clinically insane." This page is sponsored by Contact Learn of Yawl. In less than 24months, two cars have left the road and crashed through garden walls in Yawl, a narrow, bendy, 30 MPH zone where cars regularly exceed 40 MPH. The current 'village gate' system from the Talbot Arms to Tappers Knapp has had some effect in reducing speeds in the centre of the village. However, some residents have concerns about the placing of the restriction near to the top of Tappers Knapp since vehicles approaching from the Lyme Regis direction may not realise that vehicles can emerge from Tappers Knapp turning left into the village gate. Whenever the police mount a surprise speed check, they regularly prosecute dozens of careless drivers. Fact: Motorists should be driving within the speed limits so there is no need to brake hard at safety cameras if the law is being observed. Skilled drivers do not drive above the limit: they know the law and the consequences of car crashes. About half the people hit by a vehicle travelling at 30mph will die; hit at 40mph, nine out of ten will die. Speed limits are intended to provide a safe road environment for all road-users including other motorists. Latest Government figures from the 24 safety camera areas operating in 2002-03 show that cameras reduced the number of people killed or seriously injured by 40 per cent. This equates to 105 fewer deaths and over 750 fewer people seriously injured across these areas. Excessive or inappropriate speed is a major cause of road crashes. A 1mph increase in average speed has been shown to result in an average 5 per cent increase in crashes. Even if one takes the very conservative view that a third of crashes are caused by speed, this still means that in 2002 at least 1140 people were killed and 11,990 people were seriously injured in road crashes where speed was a contributory factor. Proportionally, this would translate into 275 pedestrian deaths, of which 35 were children, and 46 cyclist deaths in 2001 in crashes involving speed. Lower speeds reduce both the frequency of collisions and their severity. Hull City Council�s widespread 20mph zones have resulted in a 38.5 per cent reduction in child casualties, clearly showing a very strong link between speed reduction and casualty reduction. Transport Research Laboratory (TRL) says that a reduction of 2mph in the average speed across the road network would save 200 lives a year. More fuel is burnt at higher speeds, resulting in more air pollution and impacting on health. Driving at 50mph instead of 70mph can reduce fuel consumption by 30 per cent. As speed increases above 30mph it results in an increase in carbon dioxide emissions. The Government is committed to reducing carbon dioxide emissions by 20 per cent of 1990 levels by 2010, and the Royal Commission on Environmental Pollution recommends a 60 per cent cut in carbon dioxide emissions by 2050. Emissions from transport are currently the fastest growing source of greenhouse gases in the UK. Road traffic is the single largest source of air pollution. As many as 24,100 deaths each year are exacerbated by air pollution. Driving fast creates more traffic noise. Road traffic is the most important source of noise nuisance and tyre noise increases with speed. Road traffic noise is known to cause stress, poor sleep and mild psychiatric illness. Fast moving traffic severs communities. Busy roads can divide local communities, literally cutting them in half. Children and elderly people are especially affected. The faster the traffic is moving, the harder it is to cross the road, increasing the risk to the pedestrian. Many elderly and disabled people literally do not have the mobility to cross roads fast enough between breaks in traffic and so are cut off. CPRE research has shown that 83 per cent of authorities have no comprehensive strategy to introduce 30mph speed limits in villages. Many village high streets and through roads still have 40 or 60mph speed limits. With these kinds of speeds it is virtually impossible to cross the road without controlled crossing. High traffic speeds suppress cycling and walking. A MORI poll found that 44 per cent of people said they would cycle more if roads were safer and 26 per cent would travel less by car if the conditions for walking locally were better. High traffic speed not only intimidates cyclists and pedestrians, but the higher the speed, the greater the severity of injury on impact. If a cyclist or pedestrian is hit by a vehicle travelling at 40mph, they only have a 15 per cent chance of survival; if hit at 20mph they have a 95 per cent chance of survival. Cyclists� and pedestrians� fears about speed and road safety are based on a reality that Britain has one of the proportionally worst track records for cyclist and pedestrian fatality levels in Europe. Speeding traffic reduces the mobility of children. Children want to be able to play in the areas near to where they live, to walk or cycle to school, to be able to walk round to their friend�s house, but parents� fears about speeding traffic and road safety prevent children being independently mobile. Parents� fears are not irrational: in Britain in 2002 the police reported 2800 serious child pedestrian casualties. Research has shown that fear of traffic, and of speeding traffic in particular, leads parents to drive their children to school. In the past 20 years car journeys to school have doubled and studies have shown that children�s free time is becoming increasingly sedentary. These low levels of activity (and poor diets) are leading to rising rates of obesity in British children with the associated risk of coronary heart disease in later life. Children�s independent mobility is important for health, social development and forming self-reliance. Speeding traffic and rat-running through residential areas reduces quality of life and inhibits a sense of community. Many of our streets now feel like people-free zones. People walk 20 per cent less and cycle 25 per cent less than 20 years ago, while playing in the street, sitting and chatting to neighbours and other social activities have clearly also decreased. Less street activity means neighbours are less likely to know each other, reducing the overall sense of community and all the benefits of social support. Fear of crime increases as street activity falls. Speeding road traffic disproportionately affects people in deprived communities. The Social Exclusion Unit�s interim report Transport and Social Exclusion stated that deprived communities are more affected by pedestrian casualties and pollution caused by road traffic than richer communities. Children from the 10 per cent most deprived wards in England are three times more likely to be hit by a car as a pedestrian. Road crashes caused by speed cost at least �5 billion a year. The DETR estimated the value of preventing all road crashes and casualties at �16.3 billion for 1999; preventing even a third of these crashes would bring an economic cost benefit of �5 billion a year. Hull City Council�s programme of 20mph zones has cost approximately �4 million to implement. However, the savings in terms of injury costs have been estimated at �40 million, meaning Hull�s programme has paid for itself ten times over. Slower speeds improve the capacity of the road to carry more vehicles. The capacity of the road network is increased when drivers approach roundabouts and junctions slowly and smoothly resulting in a more continuous flow of traffic and greater through-flow. Reduced speeds also result in reduced crashes. Road crashes are a major reason for congestion, preventing traffic flowing. More research is needed to determine the cost: benefit of slower speeds in terms of journey time.